» Apples Galore & So Much More! Apples Galore & So Much More! Relaxing weekend wagon rides through Owen Orchards and near-by farm fields. Wedding receptions, family gatherings, and class reunions in the Owen Orchards barn reminiscent of a simpler and less complicated time. Excited high school students and prom-goers posing for memorable portraits. Tours and educational visits that give everyone a glimpse into the infrastructure behind farm-to-table. At Owen Orchards, everyone can connect with the working farm, from gazing upon the chickens to biting into a fresh apple they’ve just picked themselves. For youngsters, a visit to Owen Orchards is an opportunity to learn where the food they see in a supermarket actually comes from. For others, Owen Orchards is the perfect place to spend a quiet afternoon, and it’s not uncommon for folks to spend hours peacefully walking among the apple trees. Owen Orchards facilities are also the perfect venues for special occasion gatherings and can be reserved in advance. Mid-week wagon rides and tours through Owen Orchards (whether large school groups or home schooled students) should also be scheduled ahead of time. 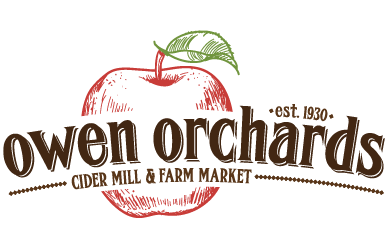 At a time when almost 75% of original apple cider mills are gone, Owen Orchards apple cider is the old-fashioned, all-natural choice that’s worth a trip from anywhere! Unlike jugs of supermarket apple cider that contain preservatives, Owen Orchards apple cider is produced in its own in-store cider mill and sold as quickly as it’s made. If you’re looking for something sweeter than naturally sweet and crisp apples, then Owen Orchards homemade candy apples and caramel apples are just the thing. Best of all, Owen Orchards can accommodate special large orders of candy apples and caramel apples, making them the perfect favor for weddings, bridal showers, and birthday parties! Planning on spending the afternoon wandering through Owen Orchards? Then stop into the Owen Orchard farm market first to pick up picnic essentials—Croghan Bologna, 1000 Islands River Rat Cheese, locally produced mustards and salsas, and apple cider slushies. Before you head home after apple picking at Owen Orchards, be sure to stop back in for real honey, New Hope Mills pancake mixes, maple syrup, and of course plenty of Owen Orchards apples and apple cider! 1. Fill a casserole dish with your favorite peeled and chunked apples. 2. Microwave until soft, about 12 to 15 minutes. 3. Mash with a potato masher for a chunky applesauce, or mix with an electric mixer for a smoother sauce. 4. Flavor with cinnamon and sugar to taste. 5. Store in a sealed container in the refrigerator. 1. Take your favorite hot dogs and put them in a frying pan. 2. Add apple cider to the pan to just cover your hot dogs. 3. Simmer on medium heat until the apple cider starts to foam. 4. Stir gently until the apple cider thickens into a syrup or glaze. Be careful not to over cook or the syrup/gaze will burn. 5. Remove pan from the heat and serve. © Copyright 2015-2016 Owen Orchards. All Rights Reserved.